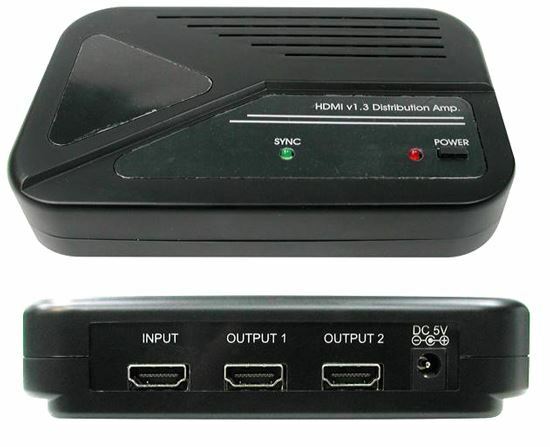 CYP HDMI 1 in 2 out Splitter HDMI, HDCP 1.1 and DVI 1.0 compliant. The HDMI v1.3 Distribution Splitter from Cypress Technology is the most advanced solution to HDMI signal distribution. Each product in this Cypress series is compatible with HDMI v1.3 specifications as well as harnessing cutting-edge technology which defines the support to transfer Deep Color (10-bit and 12-bit) video and new lossless compressed (Dolby TrueHD, Dolby Digital Plus and DTS-HD Master Audio) digital audio, with a high bandwidth up to 225MHz (6.75Gbps). Besides splitting and distributing, the HDMI v1.3 Distribution Splitter also amplifies signal provides high performance I/O of audio and video. HDMI 1.3, HDCP 1.1 and DVI 1.0 compliant. Supports Deep Colour video up to 12bit, 1080p@60Hz. One HDMI source which connects up to two HDMI displays simultaneously. Splits audio and video from one HDMI input source up to two outputs without signal loss. Supports DVI source and DVI display by using HDMI to/from DVI adapter cable. Dolby Digital, DTS digital audio transmission (32-192kHz Fs sample rate). Supports a wide range of PC and HDTV resolutions from VGA to UXGA and 480i to 1080p. HDMI cable distance test with 1080p/8bits resolution, the Input/Output distance can run up to 15/15 meters. with 1080p/12bits, the Input/Output distance can run up to 10/15 meters.